In the middle of the 5th century the Roman Empire had all but disintegrated. In the Western part of the empire Vandals, Visigoths, and Franks had replaced Roman power with puppet emperors, controlled by the aforementioned group, collectively referred to as barbarians. And as if that wasn't enough, Odovakar, a Herulian (one of the Teutonic tribes) had seized power in Rome. It is easy to understand why Simplicius was not looking forward to dealing with the political upheaval in the west, but as it turned out he need not have worried because, Odovakar treated the church with respect. This is not to say that Simplicius didn't have his headaches, he did, but they came from the Eastern Empire. The usurper, Basiliscus, drove Emperor Zeno from the throne. Needing Monophysite support, Basiliscus placed many heretics in key positions. Monophysitism began as a response to Nestorianism. Nestorius, who was made Patriarch of Constantinople in 428, refused to call Mary Theotokos (Mother of God), because he believed the child in her womb was thoroughly human, declaring that His Divine Nature existed only before and after his incarnation. In direct opposition to this idea, Eutyches taught that Christ's human nature was dissolved in his divine nature "as a drop of honey dissolves in the ocean" and that this dissolution formed the one and only nature of Christ. This teaching was called Monophysitism (one nature) Each faction was, in their own way, attempting to preserve a part of the truth about Christ's person. Eventually Pope Leo, called the Council of Chalcedon to resolve the issue, among others. The bishops decided that unless Christ is fully God, he cannot redeem us, and unless he is truly man, he cannot stand in our place. The bishops therefore issued a statement declaring, "We teach . . . one and the same Christ, Son, Lord, Only-begotten, known in two natures without confusion, without change, without division, without separation." This declaration however, did Simplicius little good. In the 17 years since the Council of Chalcedon, the Monophystites hadn't gone anywhere. In fact their influence had grown, hence Basilicus' perceived need to placate them to hold power. To further demonstrate his support for the Monophysite position, the usurper ordered the acts of Chalcedon burnt, much to the pleasure of nearly 500 bishops. Simplicius found himself defending Bishop Acacius of Constantinople, the lone bishop who resisted the Monophysite error. In Alexandria, Egypt, things were even worse. Not content with screaming at each other and making overt accusations about their parentage and sexual habits, (common elements of debate for the time) rivals in Alexandria tortured, murdered and assassinated each other. A Monophysite monk, known only as Timothy the Cat, butchered and roasted the patriarch of Alexandria three days before Easter, and triumphantly seized his office. In the early centuries of theological debate, agreeing to disagree simply wasn't an option. That doesn't mean some didn't try. Emperor Zeno eventually regained his throne and defrocked the Monophysite bishops. However, Zeno had learned a valuable lesson about the political and even military power the Monophysites. So in an effort to arrange a compromise he issued the Henoticon (Act of Union) a document of faith that was worded vaguely enough to escape the charge of heresy while leaving the Monophysites sufficient latitude to retain their views. But compromise was not possible. Simplicius' defense of the principles laid down at the Council of Chalcedon ensured that the orthodox view of Christ was retained in the West, and eventually accepted by many other factions of the church, including the Protestants. But the debate has never fully subsided; the Church of Ethiopia remains Monophysite to this day. 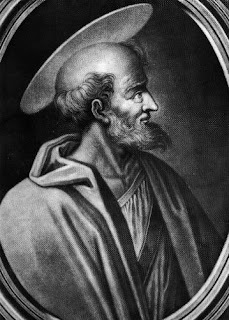 Simplicius was elected Pope on March 3, 468 - 1540 years ago this week. Other events this week in church History. March 1, 1854: Pioneer missionary Hudson Taylor arrives in Shanghai, China. Taylor would found the China Inland Mission in 1865, other missions criticized his idea that missionaries should live and dress like the people they seek to evangelize, but it would prove to be an important contributor to his success. March 2, 1938: Lutheran pastor Martin Niemoller, one of the founders of Germany's "Confessing Church," is sentenced to seven months in prison for opposing Hitler. March 4, 1583: Bernard Gilpin, the English clergyman whose ministry in neglected sections of Northumberland and Yorkshire earned him the title "Apostle of the North," dies at age 66. March 5, 1797: The three-masted ship Duff arrives in Tahiti's Matavai Bay, completing a 207-day voyage from London. The ship, commanded by Captain John Wilson, had aboard 37 artisans and pastors of the London Missionary Society (L.M.S.) and their families, who were to be resettled in the South Pacific on the islands of Tahiti, Tonga and the Marquesas. March 6, 1475: Italian artist Michelangelo Buonarroti, famous for his paintings (the Sistine Chapel), sculpture ("David"), and architecture (the rebuilding of St. Peter's Cathedral), is born in Caprese. March 7, 1274: Thomas Aquinas, one of the most significant theologians of all time, dies at age 48. Known for his adaptation of Aristotle's writings to Christianity, he became famous for his massive Summa Theologiae (or "A summation of theological knowledge"). In its early pages, he stated, "In sacred theology, all things are treated from the standpoint of God." Thomas proceeded to distinguish between philosophy and theology and between reason and revelation, though he emphasized that these did not contradict each other. Both are fountains of knowledge; both come from God.